When was the Bloody Lane Observation Tower built? A lot of people are curious about when the observation tower was built in the Bloody Lane. O.T. Reilly comes to the rescue and tells us that it was in 1895. Many people have referred to the NPS Administrative History that has a report in it from 1896 that says, basically, that they just finished the tower. But these newspaper items bring us a more precise chronology of the structure's beginnings. O.T. Reilly wrote Sharpsburg Items in the local newspapers from 1887 until 1942, just two years before his death. I am systematically transcribing these thousands of gems because they represent the best documentation of any battlefield's memorialization period that, bar none. Not even John Bachelder left such a legacy in Gettysburg. I had an incredible hike out to Black Rock today. I can see it from my house but when I have hiked it before I have only gotten to Annapolis Rocks, which is a few miles shorter a hike. 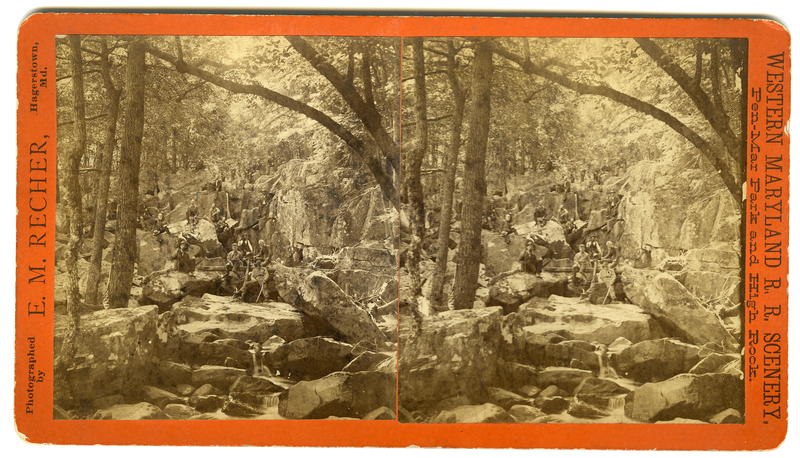 I have a beautiful stereoview taken by E.M. Recher of some of the rocks and wanted to verify that the image is in fact Black Rock. But the fact is I was more interested this time just to see if I could do the hike without having a heart attack. I did not bring a printed copy of the image, and once i got there, I was not prepared for the onslaught of flies. So I will return soon with a copy image and some bug spray. That said, I did get some beautiful images and am confident that I was at the right spot, or at least the general area. 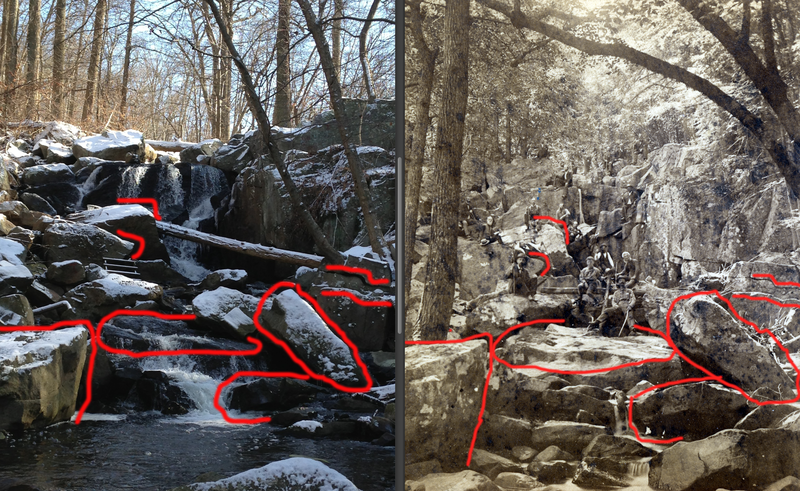 I am not confident that I found the exact rocks, certainly not the ones in the then and now above. 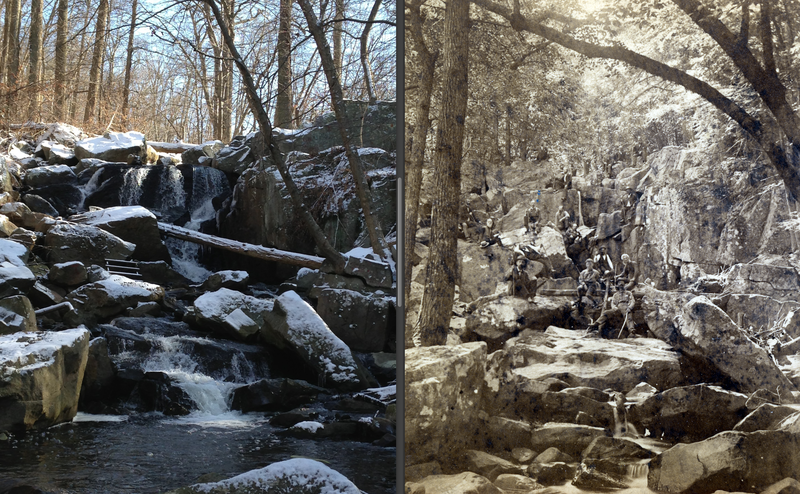 It occurs to me, though, that the rocks may have fallen in the 130 years since the photograph was taken, so this may take some time. Also, the rock cliffs there are very precarious and there is a very long rock slide ledge to examine, easily a quarter-mile long. Dangerous but beautiful place, which can be said of most of South Mountain, certainly here where you can find Black Rock, Raven Rock, and High Rock. I feel blessed to have these stunning sites right along the Appalachian Trail basically in my front yard. A few weeks ago I talked about this monument to the 11th Connecticut at Antietam, and how it was originally in Connecticut Park before being moved down by Burnside Bridge. Well it turns out that another Connecticut monument was almost placed there also, the one to the 8th Connecticut. Your correspondent is in receipt of a letter from a member of the 16th Conn. regiment stating that the 8th, 11th and 16th regiments of that State, will erect monuments on the 10 acre lot of the 16th Conn., south of town, in time to be dedicated on the 17th of September next. The 10 acre lot referred to is called Connecticut Park. It is the north-east quadrant of Otto's forty-acre cornfield where now stands the monument to the 16th Connecticut. Mr. John S. Lane and son, Harry C., of Meriden, Connecticut, who stopped at the Wyand House one night this week, were looking over the battlefield the past few days, viewing the field of carnage where Mr. Lane, Sr., helped to defend the Stars and Stripes thirty-two years ago. The State of Connecticut appropriated $1000 for each regiment of that State to be used in erecting battlefield monuments where they did their hardest fighting. Mr. Lane who is a member of the 8th Conn., bought of Mr. Uriah Gross, near Sharpsburg, a plot of ground 20 feet square for which he paid Mr. Gross $100. A monument will be erected on the spot at once and will be unveiled in October. So, the 8th CT monument was to be "where they did their hardest fighting" and the dedication date had been moved to October. It is amazing to think that only three months before their monuments were to be dedicated, the veterans were still finishing their plans. 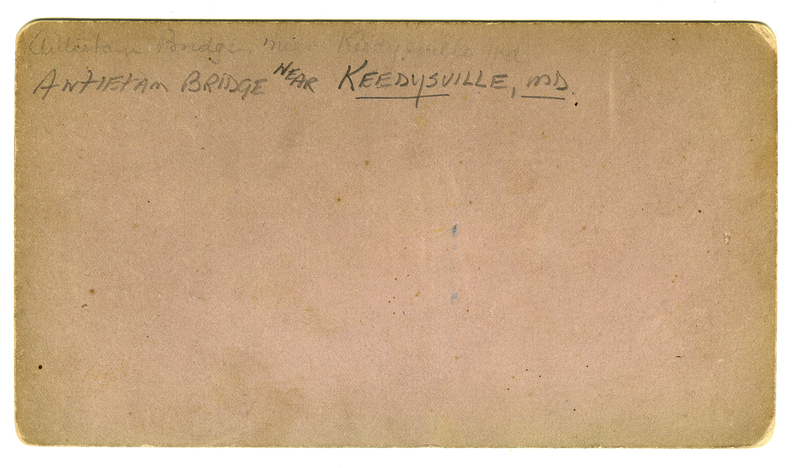 Also interesting to note the they may have crossed the Long Bridge to get to Wyand's place in Keedysville. The Wyand brothers had places across the street from each other, one a store and the other a train station/hotel. I will post some great old photos of those places soon. A truly remarkable Antietam find! This really blew me away. 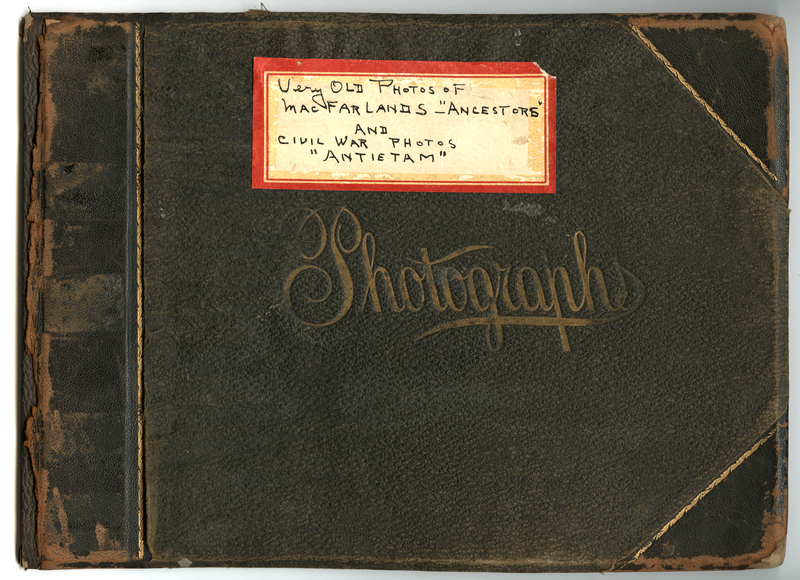 Probably the most important acquisition I made during the writing of my book, Rare Images of Antietam, was an album of photographs taken by a veteran of the battle named Solomon McFarland. He took many very rare images of Antietam Battlefield and I was lucky to find them right before I finished my book. 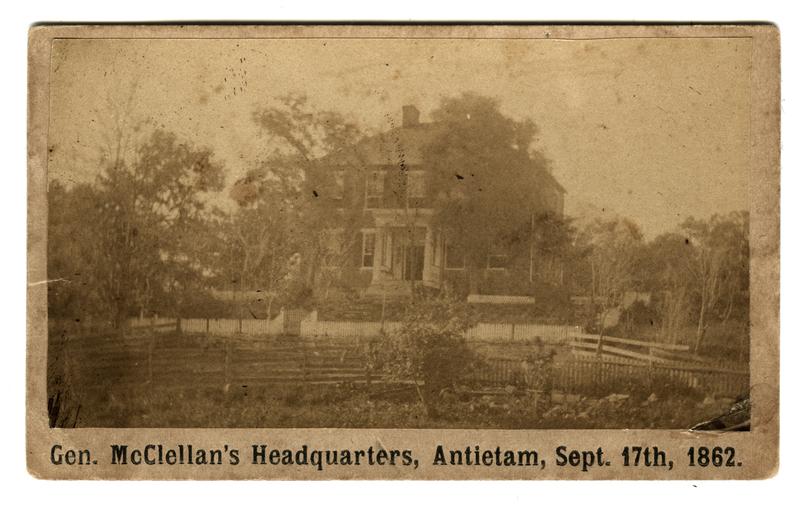 Well, I recently bought a group of Antietam stereoviews taken by B.W.T. Phreaner. They were on an online auction so I never really got a great look at them. 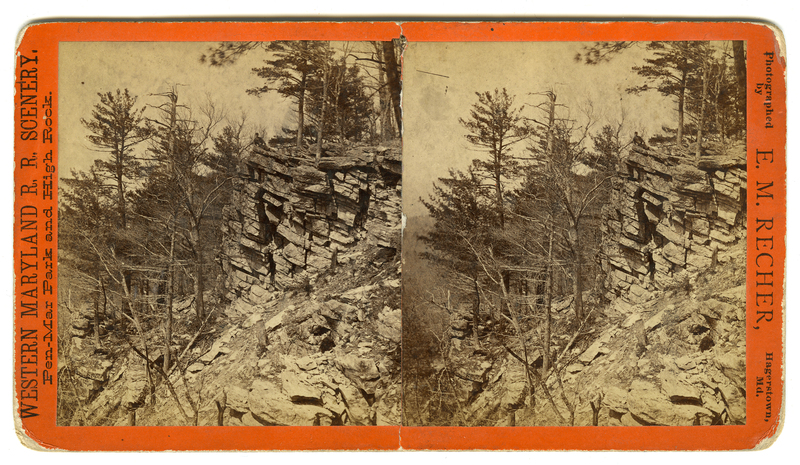 I only knew that they were Antietam Phreaner stereoviews, and they are quite rare. So, imagine my surprise when they came in the mail and I looked on the back and I saw that they had belonged to Solomon McFarland himself! They even had a date, 1887, which will be a real help interpreting them. 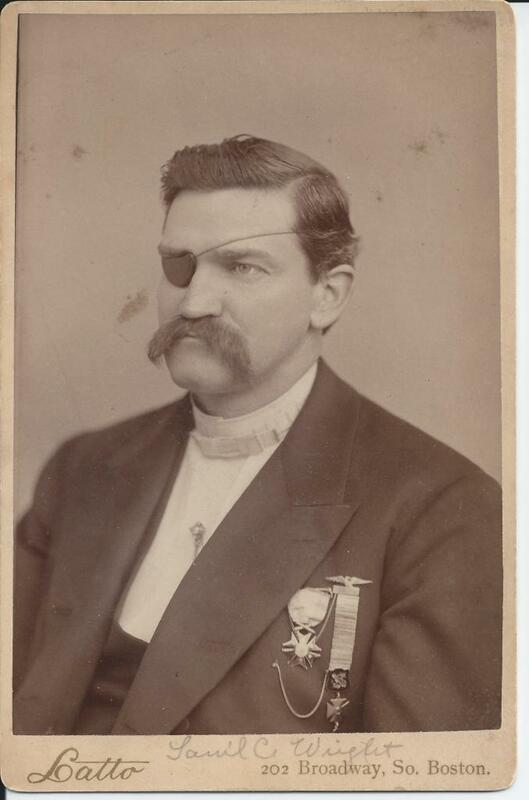 Another cool thing is that the lot includes two stereoviews taken by Alexander Gardner of the Antieatm dead. When William Tipton wanted to re-publish those images he apparently was not able to find copies, so McFarland loaned him his. These may well be two that Tipton borrowed from McFarland. O.T. Reilly's "Battlefield Guide" Published? 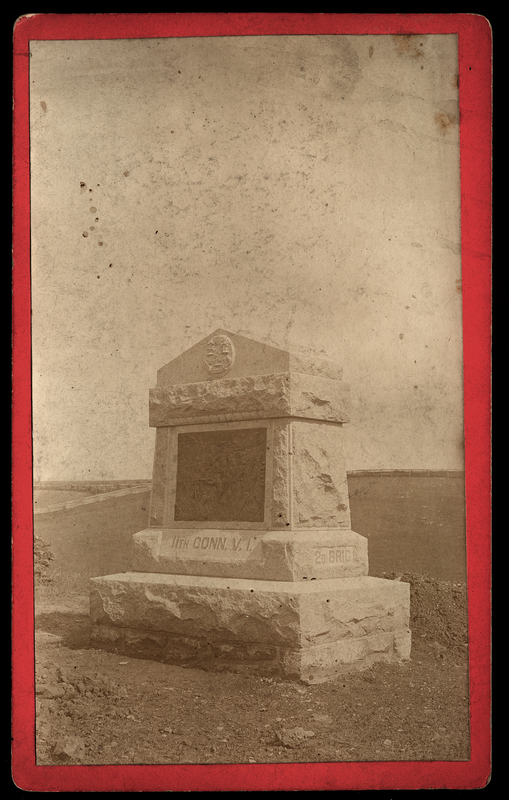 In 1894, a few months before the Connecticut soldiers returned to Antietam to dedicate their monuments, O.T. Reilly put this in the Antietam Valley Record. I have been wanting, for a few years, to see what I can learn about this "Guide." On reading this over, I believe that the photographs were not put into this guide. O.T. 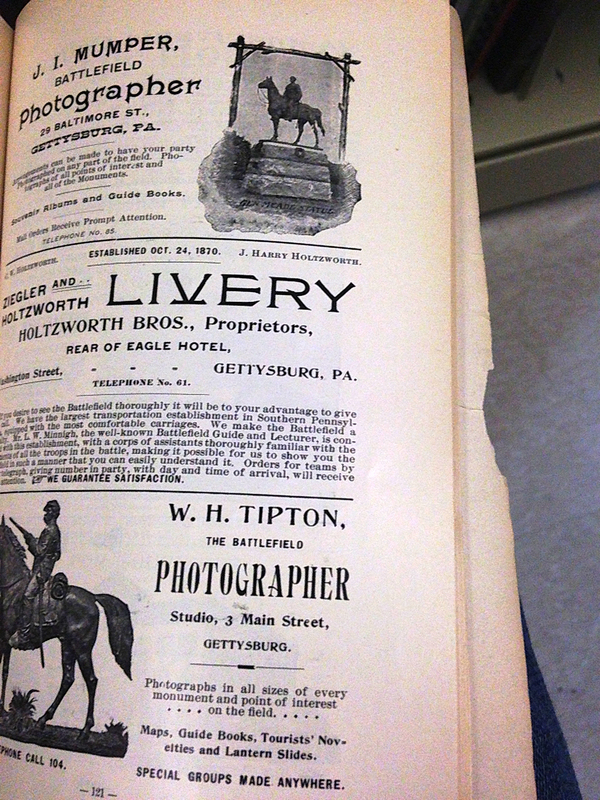 did publish a photo-filled guide book in 1906, but I have never seen the guide he speaks of here. My guess is that the photographs he is talking about were taken by J.H. Wagoner. I posted one of them a few days ago, and will try to match other mentioned with photographs in my collection throughout the spring. He wrote a lot about the Connecticut soldiers and their monuments, so I will be posting as much as I can about that. O.T. 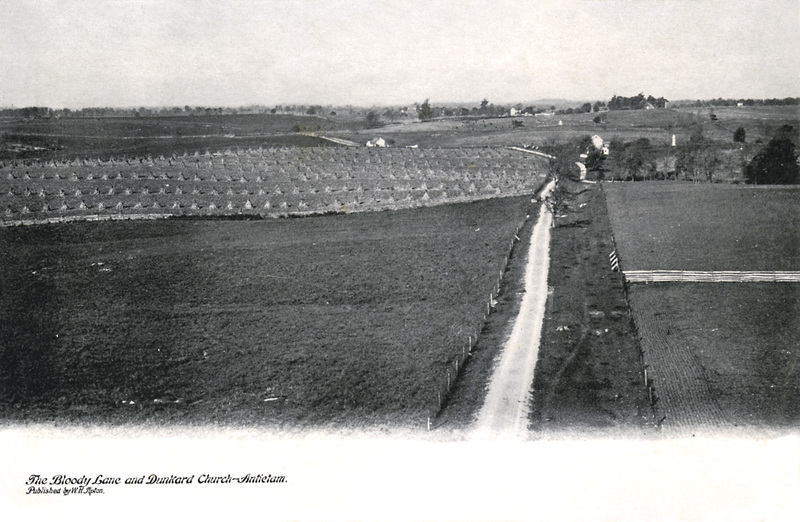 Reilly of Sharpsburg, Md., has lately had some photographs made of the 10 acre field at Antietam owned by the Sixteenth Conn. regt., also of the Reformed church, showing the front Memorial windowwhich was presented to the society by the regiment. He also has pictures of Burnside bridge and the two other bridges above. The Dunker church, National cemetery, Bloody Lane, Roulette's farm, McClellan's headquarters, Poffenberger's house and barn, Reno monument and other scenes of interest to soldiers and citizens. Mr. Reilly also deals in relics. A "Battlefield Guide" is a convenient and interesting work, as it gives a review of the Maryland campaign from September 1st to the 20th, 1862, and, of course, includes South Mountain battle. Any one expecting to take in the October excursion of the 8th, 11th, 14th, and 16th regiments will find in the "Guide" and these pictures much to assist them in sight seeing on that memorable bloody field. One day I went over to her house and, true to her word, she handed me a stack of amazing images of Antietam Battlefield taken by J.H. Wagoner of Hagerstown that she had found in O.T. 's shop after he died. I could not believe my eyes, or her generosity, for that matter. I had read that back in 1894, O.T. hired Wagoner to take pictures of the battlefield for a guide book that was to be sold at the dedication of the Connecticut monuments in October 1894. I have never seen the book and believe it was never published. I also believe that these images Missy gave me where taken for that book and were never published and have never been seen before now. Typically I would not put such a rare image on the web before I had a chance to include it in my book, but it will take me another ten years to get another book out, so I figure I will just blog about my research and let people enjoy these great images as I go. In the days to come I will have a lot to say, in O.T. 's words, about this monument and Connecticut Park in which it sits. A few months ago I joined the Antietam Historical Association on their tour to the site of Blue Mountain House up by Pen Mar Park. The event was run by Todd Andrew Dorsett, who is one of the most knowledgable guys on this area. I had a real blast and was glad to meet Todd. Our tour guides were two young lads, Brett Reichard and Jared Wagaman. And when I say young lads, I mean that they are in high school. I was thrilled to meet these two youngs guys who are both deep into the local history and have enthusiasm to match. It is exciting to see some new blood at these historic sites. Brett has been following my Western Maryland Railroad posts and graciously offered to show me where the cascades are. E.M. Recher photographed this site back around 1880, and it has been on my list of sites to find. Brett said that since I showed him where Jack's Mountain Tunnel is, he wanted to reciprocate by showing me the Cascades. Well, of course it snowed last night and we (Brett, Jared, Todd, and me) planned to meet at noon because the temperature was expected to be a balmy 25 degrees. We met at Pen Mar and drove over the mountain to Falls Creek near Fort Fitchie. On our way to the site we walked a short distance on the old Western Maryland Railroad track and saw not one, but two trains on the way. BTW, we even saw one ont the way back, and it was right in the old Pen Mar cut. It was quite a thrill. On the way to the cascade, Brett and Jared showed us some ruins of the old trolley bridge, which was very cool, but on the wrong side of Falls Creek to get to the Cascades. So for a few minutes we tried to cross over the creek, on rocks. Not a good idea. So, we walked thorugh the snow and brambles until we got to the train tracks and that is when the first two train passed us. I mean, Recher took those old photos because that spot was on the train line, but it is rare to see them running, and three in one day! We made our way down to the creek and found the exact spot where Recher had his camera. It was a real thrill. Many of the rocks were exactly the same as they had been 135 years ago. Even cracks in the rocks were the same. I felt like Fraz. Anyway, we took some images, and on our way out we heard a train coming up from Pen Mar. You have to understand that when the first train passed we were on the tracks but a ways from the cut. We bemoaned the fact that we did not have time to get to the cut and stand there while aa train went through it. So, when we heard a third train that would be coming through the cut, not for another minute, we looked at each other, nodded, and started for the cut. And there we stood as it went through the cut. It was awesome! 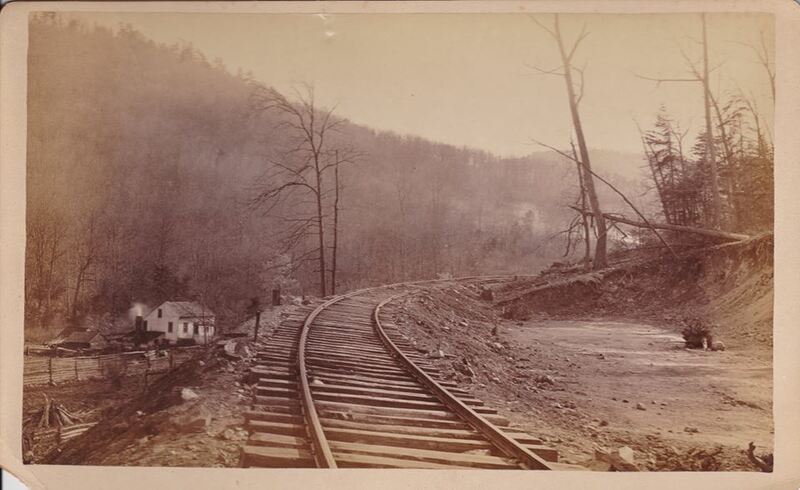 When I began researching Rare Images of Antietam, I found that many of the photographers who took early photos of the battlefield also took images of the Western Maryland Railroad. 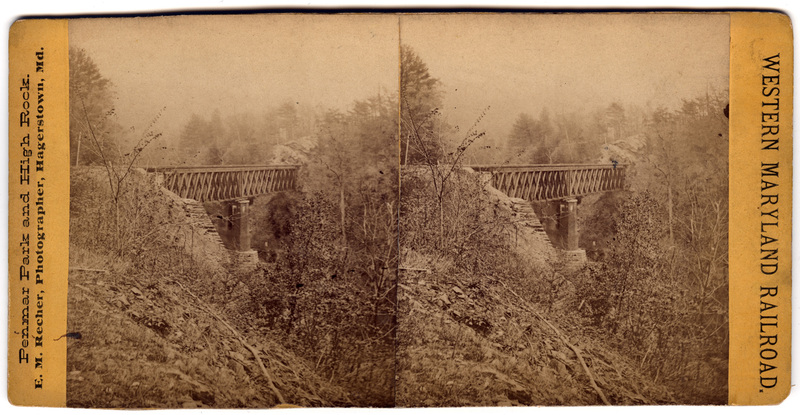 So I figured that if I researched the WMRR photographs, they may lead me to images of Antietam. Well, that has come true, almost. At least I have taken a step in the right direction. After a few years of looking, and having now become truly obsessed with the Western Maryland Railroad, I have discovered that the railroad published a number of small books with a lot of information about Gettysburg. They are not about Antietam, but they are exciting, nonetheless, and they certainly point in the right direction. 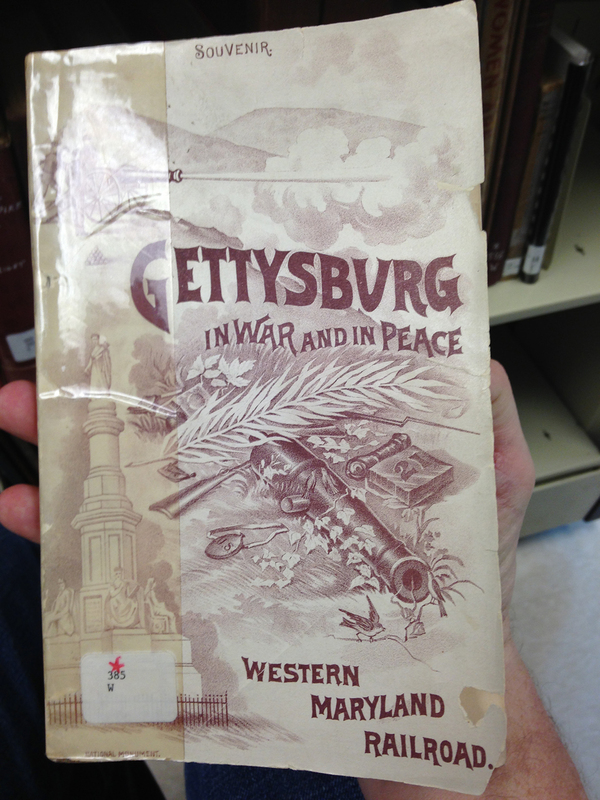 This is one of the books I found at the John Frye Western Maryland Room at the new Fletcher Library in Hagerstown. Gettysburg historians are missing a great local resource if they have not made the trek down here. The observant reader will notice that the book includes an ad for Levi Mumper, the photographer whose images, owned by Gettysburg photo-historian Sue Boardman, led me to this northern branch of the railroad, and ultimately to this find. Interestingly, I hang out at the Western maryland Room all of the time, but it was her photographs, and my following the threads they exposed, that led me to find these books, hidden in plain view on shelves I have sat next to many times. John Frye and Elizabeth Howe, who maintian that collection, would get a giggle at my saying I "discovered" these books...er, that they have sitting on a nice temperture controlled shelf, neatly listed in their catalog. Suffice it to say, I am not Indiana Jones - they did the hard work. Yesterday, or actually early this morning, I talked about a walk I took on the old Western Maryland Line up on Jack's Mountain. I was trying to find some pictures taken near one of the seven bridges on that line. This was the only tunnel dug early enough to be in the photo. It is about 2.5 miles southwest of Fairfield and was built in 1889. Nonetheless, I did not find the spot. That said, I had a wonderful hike and an exciting walk, or run, through the tunnel. Scary stuff, but it was worth it for the pictures. 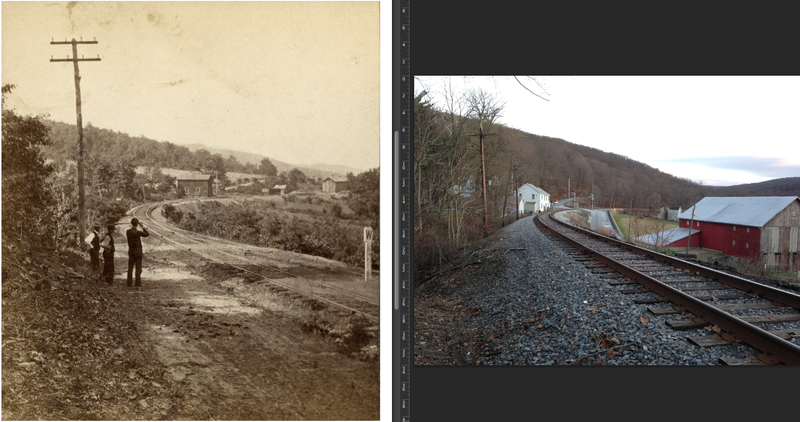 Western Maryland Railroad in Pennsylvania? One of the best things about studying the history of this area is that you meet some of the greatest and most interesting people. Licensced Gettysburg Battlefield Guide and premiere Gettysburg rare image collector is one such person. About a week ago, Sue responded to some Western Maryland images I posted by posting a few of her own images. As usual, her images are stunners. This one was taken by Levi Mumper, known mostly for his early images of Gettysburg battlefield. He also came down to Antietam and took some early images, one of which made it into my book Rare Images of Antietam. 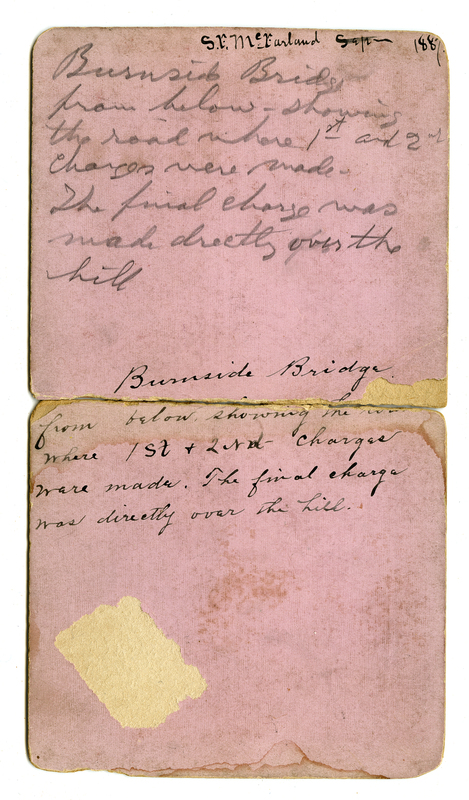 The captions on the back of her two images led me to believe that they were taken just outside a tunnel on the Western Maryland Railroad line. 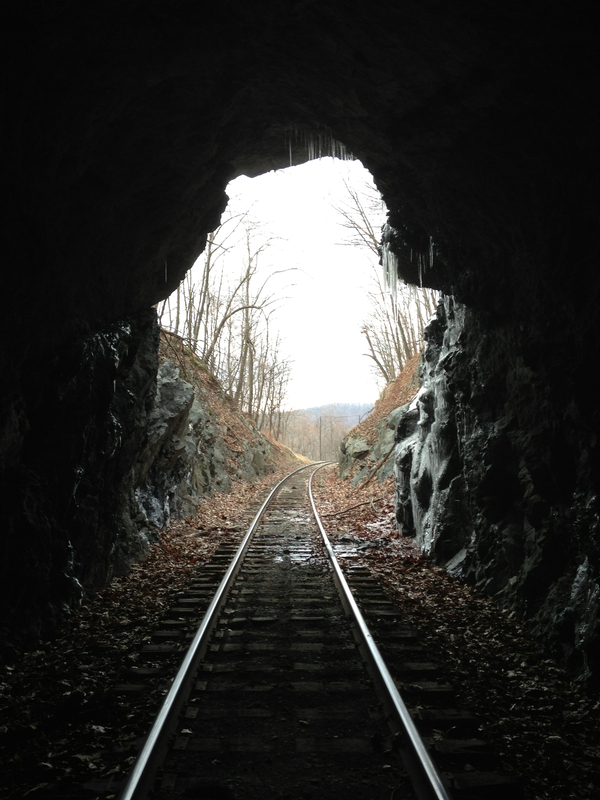 So I began my research by discovering that there were seven tunnels on that line, and the only one that was built early enough to be in the image was the only one in Pennsylvania, and it was on the spur leading from Maryland to the town of Gettysburg. Better still, it sits smartly on top of Jacks Mountain, a main feature in the Battle of Monterey Pass. Bingo!...perhaps. Last weekend I tromped up there and found the tunnel. Those pictures are to come, but first I wanted to show the closest I came to finding a spot that is a match for the image. In the modern photo on the top, the mountain is a decent match. 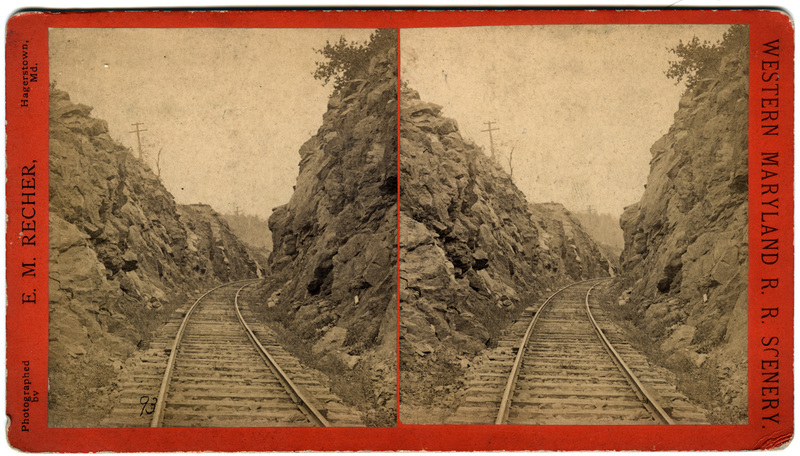 In the modern photo on the bottom, the track bend is close. Nonetheless, I don't think I found the spot. But I did have a blast hiking though the tunnel, but that story is for another day. This image was taken around the year 1880 on West Washington Street in Hagerstown, Maryland, about three blocks west of the Public Square. The house on the right edge of the photograph was the residence of Dr. Augustine Mason, C.S.A. Many Confederates lived in and around Hagerstown both during and after the war. The location of this image was easy to find, mainly because Jeff Brown told me where it is. Of note is the staircase of the Miller House on the opposite side of the street. That building houses the Washington County Historical Society, which has an amazing collection of historical photographs of this area. In fact, they have a copy of this image in their collection that was used by Stephen Bockmiller in his book, "Hagerstown In The Civil War." 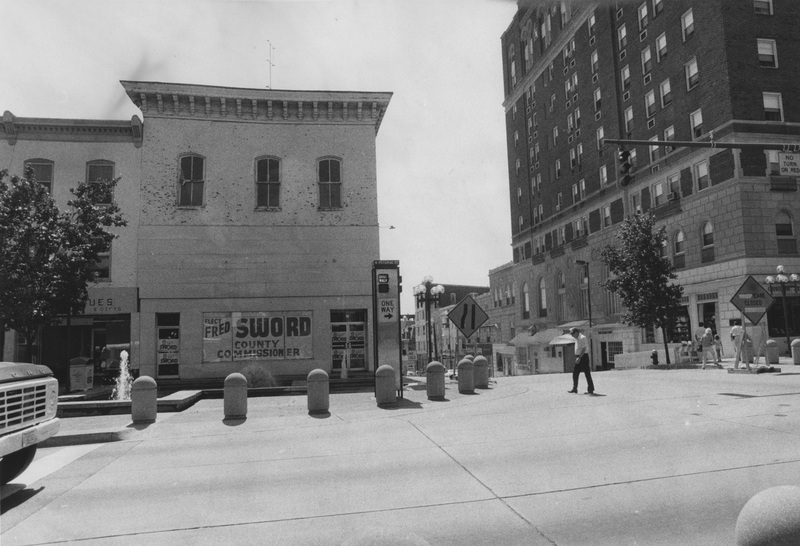 It is sad to see that most of the buildings on the north (right) side of the street no longer stand. But I guess it is best to appreciate the large number of historic buildings still standing in Hagerstown. 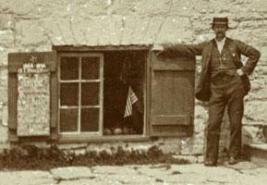 The buildings in view across the street are in such good shape it is hard to imagine that they were there in the 1880s. 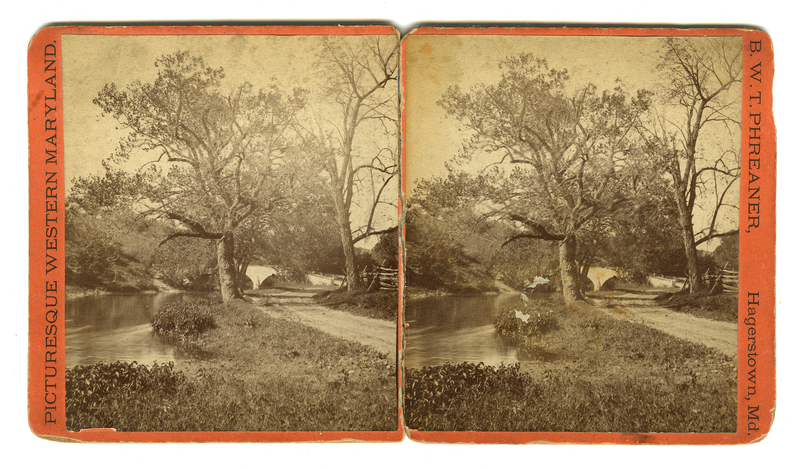 E.M. Recher, who took this stereoview, had a photograph studio on the same side of the street about two blocks behind where the camera stands. W.B. King, another photographer and a contemporary of Recher's, had a studio just a few doors behind Recher as he stood taking this image. I had a really great day today. I wanted to go hiking along the tracks near Pen Mar Park with Henry and was determined to get us up there while he still had at least a few hours worth of steam left, so to speak. When we arrived at Pen Mar, Henry wanted to play on the swings for a while. 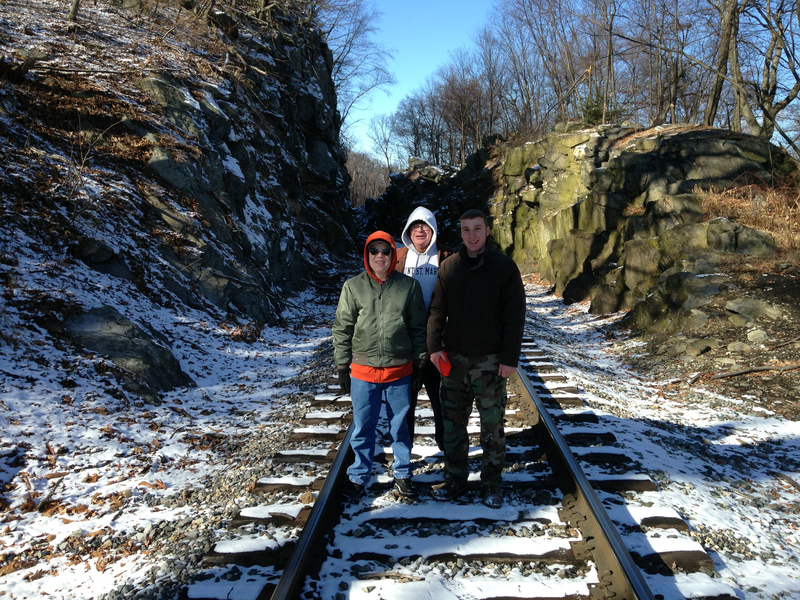 When we finally got down to the railroad tracks, we walked north towards the train station and the railroad cuts. Ten paces up, Henry announces he wants to see what is down the other way. He does this a lot. He loves to explore, and I love that he loves to explore. 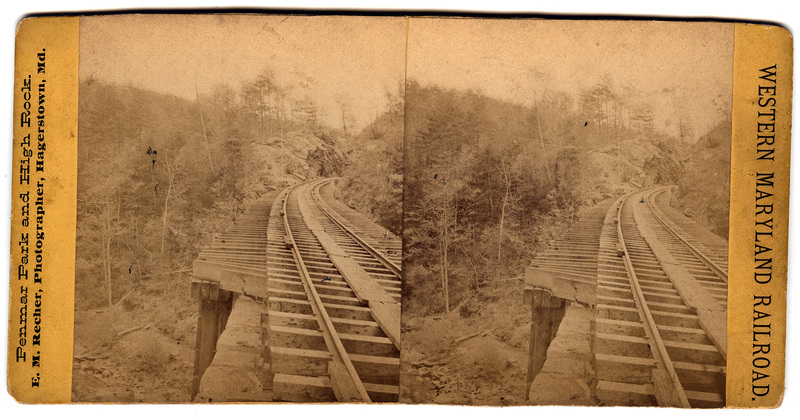 I was also excited about walking south because I recently acquired a number of Blue Mountain House stereoviews, and want to see if there is anything left of the old train depot for that huge old hotel. So south we went. Lo and behold, we rounded the very first bend and there it was, the cut I had been looking for, and henry had led us straight to it. The distinctive mountain in the distance loomed over us. The only sad thing was that it was obvious that the cut had been greatly widened over time, no longer closely skirting the trains. Finding the exact rocks in the image was not going to happen. So, I grabbed a quick then-and-now shot and Henry and I proceeded on for a few more miles. On the way back, we stopped to sit on the tracks and as I got familiar with where we were sitting I realized that we were on the exact spot where passengers disembarked for the Blue Mountain House. But that is for another day...soon. This has been an exciting month for collecting. A huge collection of local images were bought at auction recently and then were sold on eBay. I managed to win the bulk of them and just yesterday started to try and figure out where they were taken. A very exciting one is this image of Sabillasville, a small town tucked in South Mountain. The Western Maryland Railroad reached that town in 1871, one year before it rounded the mountain and reached Hagerstown. I went out there yesterday and found this spot with my son Henry, but as soon as we got there henry fell asleep and we went home. 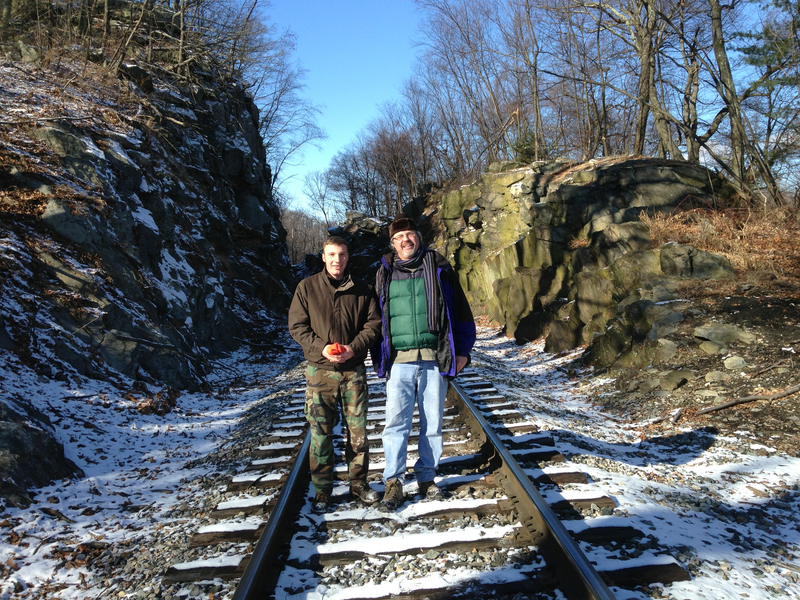 I went back today with Hagerstown historian Jeff Brown, and we walked about six miles on the tracks, finally concluding that the first spot I found is the correct one. 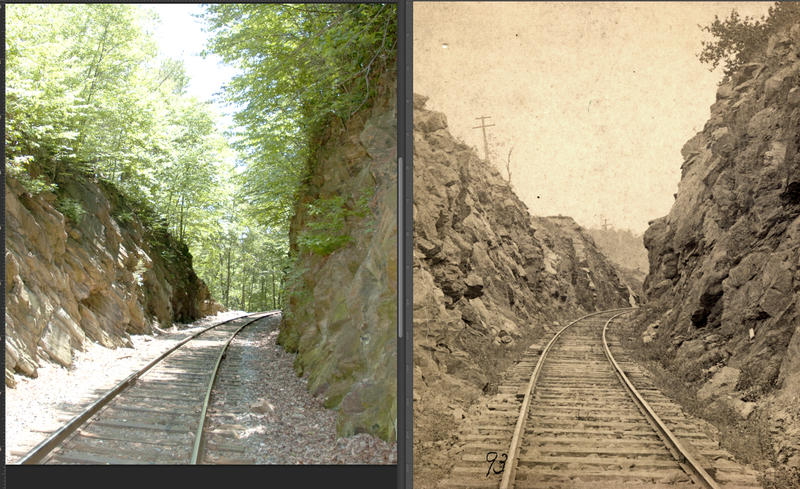 I will be going into some detail about our discoveries, but here is a then and now of the spot. 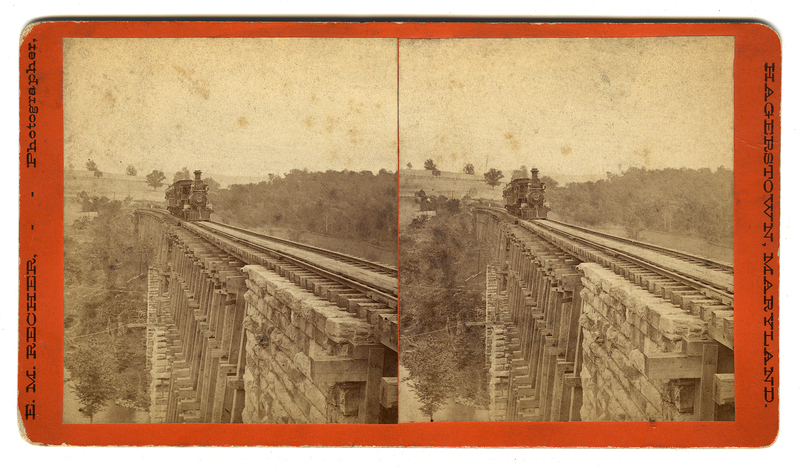 Now that I have found my original, final panoramas for Virtual Antietam, it is time to decide which software I will use to stitch together the master scene. We are talking 128 panoramas plus, well, plus a whole lot of everything, kitchen sink included. I am excited to say that after seven years away from this project, I am going to use the exact same software I had decided on in 2006 when I first did some scene tests. I spent the last few days falling in and out of love with a half-dozen software packages, but I have come back home to Pano2VR Pro. I won't bore you with why Tourweaver, Panotour, and others, just did not cut muster, but suffice it to say that I am excited beyond belief at how mature this software is. And the most exciting feature for me is the integration with GPS and Google Maps. The revelation I had last night was that I did not know that battlefield as well as I had thought. Using GPS to align my panoramas is important because I am trying to create a realistic and accurate model of the battlefield, and what I am finding is that, say, when I am standing by the Cornfield on the Indiana State Monument, the Joseph Poffenberger farm, which is out of view, is not quite where I thought it was. It may seem like a small thing, but I spend a lot of time pointing towards this and that, and to find out that my orientation is a bit off can be jarring. The good news is that once I start to dial Virtual Antietam in, the relation of battlefield sites to each other should be easier to get right. At Antietam, we guides talk a lot about how hard it was for combatants to have had any idea what was going on behind those trees, especially having just stumbled upon the place for the first time. It is interesting to find out that, even after tromping around Antietam Battlefield for over a decade, I am still not quite sure exactly what is "behind those trees." I Found Em' and Now We're Off! Once I decided to get back into Virtaul Antietam, I had to find all of the source files that I had created about a decade ago. I spent the bulk of 2002-2006 creating 128 panoramas of Antietam Battlefield. The bad news is that the hard drive that the final images resided on crashed and burned a few months ago. So I have been looking for the backup images since then, but decided to comb through my house in ernest over the Thanksgiving holiday. Long story short, after coming to the conclusion this morning that I could only find 44 of the original 128 completed panoramas, this afternoon I found a disc that had a reduced size version of every complete image! So, now I can move foward with interpreting the battle, instead of going backwards into panorama stitching. I have a lovely three-year-old son who is the center of my life, so I have no desire to give my life over to a project like I had to with Virtual Gettysburg. But, that said, I have a creative urge to interpret Antietam in a way that has never been done, and as a web developer at a great shop like High Rock, I want to keep my skill sets deep, broad, and sharp as a tack. With all that in mind, I don't have a moment to waste. That is why it is life-changing to find my finished panoramas. And I just realized that the disc also has hi-res thumbnails of each pano. It's like Christmas. I am really going a bit crazy here. It has been almost ten years since I last used panoramic imaging software. As I have ramped up my efforts to finish Virtual Antietam, I spent this evening looking at the upgraded versions of the software I used 'way back when.' Well, I was expecting great things, but I was not really prepared for how great things have gotten. Integration with Google Maps has gotten almost seamless. Different output formats such as HTML5 allow panos to play on iPhones. EFIX data integrated into the images makes linking scenes together much easier and much more accurate. The funny thing is that all of these technologies are happening outside of Drupal, yet just today I made a huge leap with Drupal-based mapping. So, although I have been steeped in great software every day for ages, I feel as though I just woke up from a decade long nap and everything is different. Reminds me of the first time I saw a universal remote control. I thought, this changes everything! The first thing I did when I arrived in Western Maryland from California in 2002 was to begin working on the panoramas for Virtual Antietam. I took over two hundred and then spent about three years polishing about 128 of them. Unfortunately, the hard drive on which they resided died about two months ago. I am having someone look at it, but in the mean time I have found my original backup discs. The good news is that the brushed picts are there. The bad news is that they are each on a single CD-ROM. Also, they are all 200+ before I numbered them and trimmed them down to 128. Anyway, that is a simple production process and I have a fresh disc drive ingesting them one at a time. Finding the time to copy them all should take about a week, and then renumbering them another week. In early December I will be looking around for the new cool way to turn panoramic images into web-viewable interactive panoramas. This is really the fun part for me, figuring out how to stretch the current technology to interpret the photographs. In the mean time you are free to enjoy the five or so panoramas that I put up on the site about a year ago. This is McClellan's Headquarters. It is a nice view, but those dern folks at Save Historic Antietam Foundation have been working as hard a beavers to knock down the trees that block the view of Antietam battlefield from here, so I may have to re-take this to take advantage of their efforts. Also, during the Center For Civil War Photography's conference last year, I took one looking out the roof of the Pry House. I have not stitched a pano in a while, but that might be worth revisiting that part of the process. 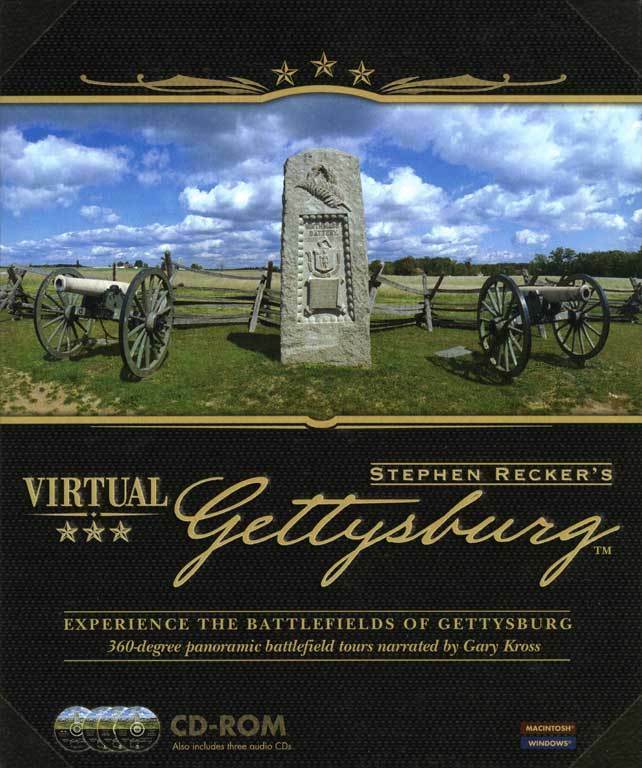 About three years ago I decided that if I were ever to finish Virtual Antietam, it would have to be an entirely different technological engine than Virtual Gettysburg, which took me five years to program. Realizing that I would never get it done in time for the 150th, I opted to write a book, Rare Images of Antietam. I picked up my first copies of my book on the way to speak at Antietam for the 150th anniversary. I had cut it close, but I made it. Well, I feel it is finally time to get back to work on Virtual Antietam. I am not sure what final form it will take, but I do know it will be a fine mix of Drupal, PHP, Symfony, Angular JS, CSS3, SASS, HTML5, GPS, oh, and lots of cool photographs. I took the first step this week and reworked the site so that it is responsive, which basically means it should look pretty good on your phone or iPad. 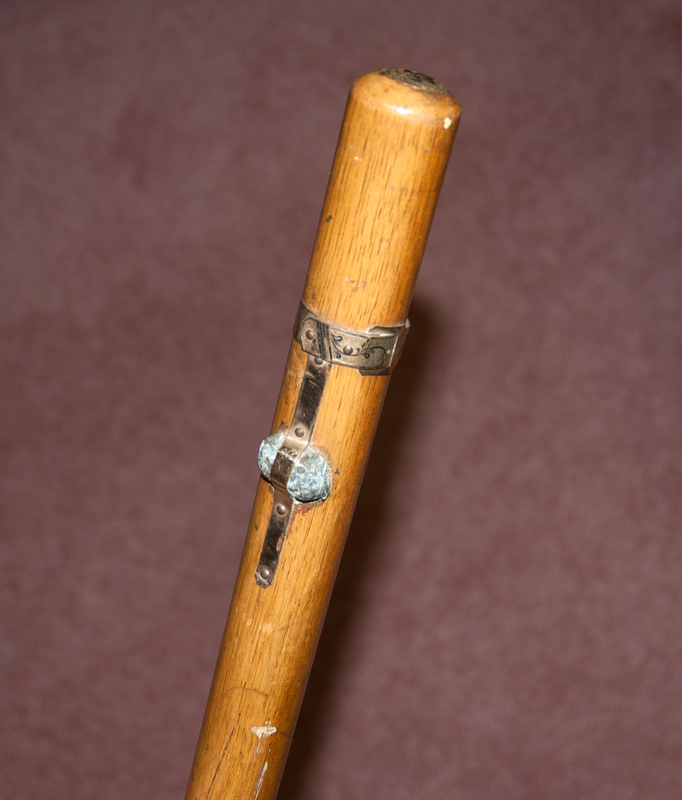 I am using a photo of one of my relics today because over the last year I started digitizing my collection onto this site. Most of it is hidden, but my intent is to integrate it into Virtual Antietam. So, this is going to be a work in progress, but I am excited to see where this ride takes me, and us...!? In 1996 I was producing CD-ROMs for Apple Computer and got the idea to see how far I could push Quicktime technology. To that end, I produced Virtual Gettyburg, which came out in 2002. It originally ran on Mac System 9 and Windows 95. About five years ago I upgraded it so that it would run on newer versions of Windows as well as Mac OSX and Intel Macs. Much to my delight it still runs great on Windows machines and Macs through Mac OSX 10.5.8. But, as all good things come to an end, it does not run on later versions on Mac OS X (after 10.5.8) nor will it in the future. In addition to that, I only have less than one hundred copies of the Virtual Gettysburg book, which I will not be reprinting. So I have been thinking about different scenarios so that I can continue to make the content of VG available for sale, although probably in a different format. I moved out east about ten years ago to work on Virtual Antietam, but although I have it two-thirds done, the technology has changed so much in the last ten years when VG was state-of-the -art, that I have decided to reprogram Virtual Antietam as an online experience, making a lot of the content available on this site for free in the mean time. I may repurpose VG at the same time. When my book Rare Images of Antietam came out I went through the usual period of anxiety when I expected a crowd of people with torches and pikes to come to my door and drive me out of town for writing such a huge tome of lies and misinformation. Well, it seems I got most of the facts correct, so far at least, exclusive of a few typos. But there was one thing that I got a bit wrong. 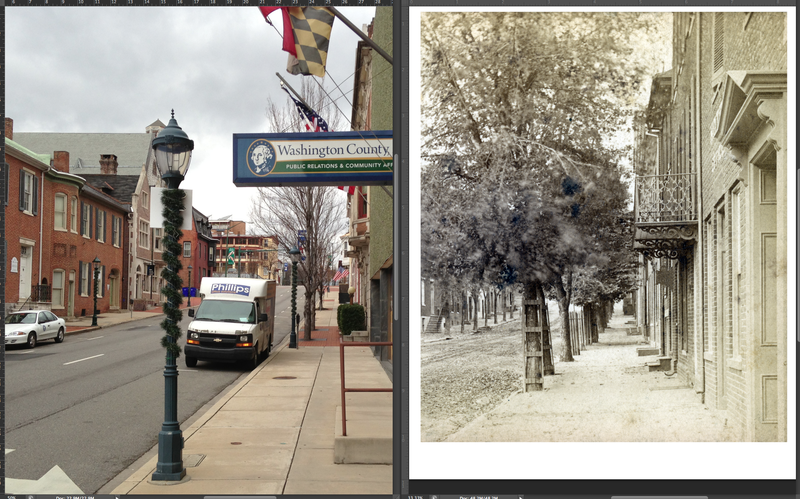 On page 12 I included a picture of the building on the "NE Corner Public Square in Hagerstown" that I represented in the book as where E.M. Recher had his studio, starting in the 1850s. It turns out that a few decades ago the original building was torn down and this one was put in its place. It is a great copy of the original, but not the original. Oh, well. To rub salt on the would, John Frye, an incredible historian whom I have the pleasure of chatting with on many of my lunch hours, recently went through the files of his Western Maryland Room and put together an entire folder of images of the original building. I will be posting those soon once I organize and edit them. In the mean time I found this image in the archives of the Baltimore Sun. It is from 1982 and is the best close-up I have seen that shows the dilapidated state of the building. It depresses me to think that I probably drove by this building years ago and did not stop. But at least I can see what it looked like and I can correct the record. This is a side view of the Owes Creek Bridge looking east. There is a marking on the back of a similar view that says 8-6-79, which I assume means that it was taken on my birthday in the year 1879. 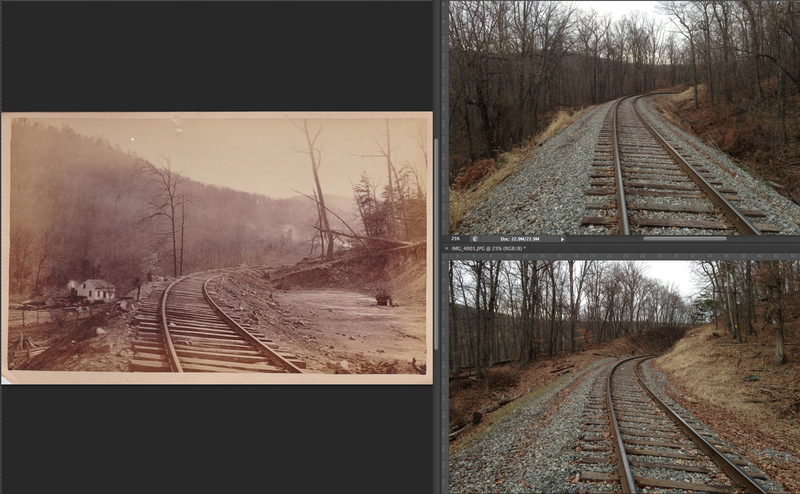 This would fit nicely with my deduction that Recher bought his stereo camera in 1878 and that Pen Mar opened in 1877, making this rail line of interest to photographers, due to the tourists that it brought out to Western Maryland. I have not had a chance to check the handwriting to see if it is Recher's, but the fact is that Recher probably handled all of his images before they went out which is why you so often see his writing on the back. There are two bridges that cross Owens Creek very close to each other. One is Tall, the other Short. The Short Bridge is straight across and the Tall Bridge curves to the right as you are going east, which is why I believe that this view is the Tall Bridge looking east. The only problem is that the two views of the bridge that I posted earlier are, I believe, from the other end of this same bridge. Those views both have a big pole in the foreground of the view, which would be the background of this view. But that pole is not in this view. Anyway, I hope to get out to the site in the next week or two. There are enough features in the image to get things straight. I am speaking at the Smithsburg Historical Society in a few weeks and hope to have some of this sorted out by then. 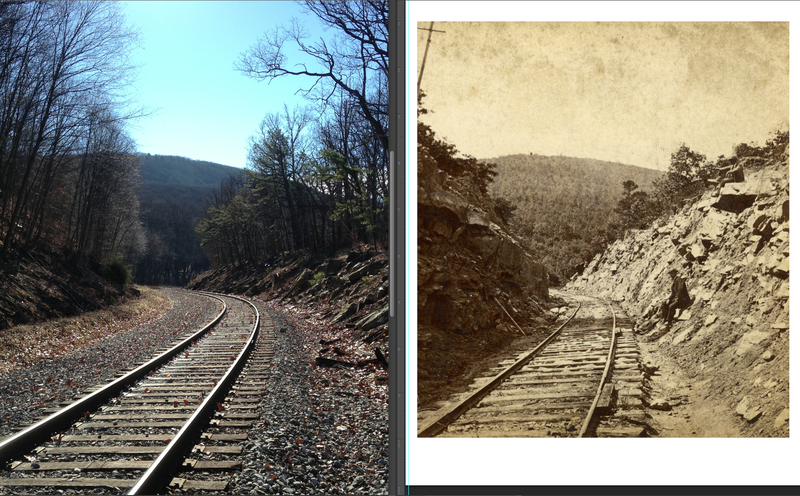 I am anxious to show these views as no one I have spoken to, even the local railroad historians, have seen these images. I can't wait to hear their feedback. I am sure they will have lots of interesting info to add.